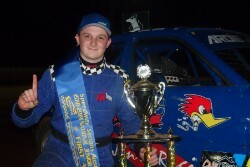 Ardie Jonic has successfully defended his National Junior Sedan Title, and in the process has become the first driver to do so since Todd Waddell won the first three National Titles, at the Fraser Shores Maryborough Speedway on Sunday night. The race had just the one stoppage, with Jonic leading all the way, chased valiantly by Braith Hogan who started on the front row with Jonic. The only stoppage took out both Mason Cameron and Casey OConnell in turn three, both forced to retire with flat tyres. Jonic slowly but surely moved away from Hogan who had a handy buffer over Todd Moule who was just ahead of a great battle for the fourth place which involved Jye Irving, Kasey Garlick, Erik Wallace, Kurtis Peall and Darcy Micallef. Jonic was able to keep himself clear of Hogan as he went through lapped traffic, and went on to win by 4.099. Hogan was brilliant all weekend, and thoroughly deserved his second placing, while Todd Moule was extremely fast all weekend. Eric Wallace drove great after plenty of dramas on the opening night to finish fourth, with Jye Irving a credible fifth, driving his Charade for just the sixth time, after driving a Datsun for most of his Junior career. Kasey Garlick would finish sixth, and proved to be highly consistent across the weekend after being on the podium at the Mt Gambier Title two seasons ago. Earlier, the C Main was exceptional with every car finishing, with Jaiden Santin and Kayden Swindells advancing to the B Main. The B Main, did lose some cars, but was a thrilling race from start to finish, which would see Ellie Peacock narrowly defeat Jayden Triffett who led for the majority of the race, with Rhys Meakins third and Kayden Swindells snatching the final transfer spot on the last corner. The next National Junior Sedan Title will be in exactly twelve months time at the Make Smoking History Collie Speedway, in Western Australia.